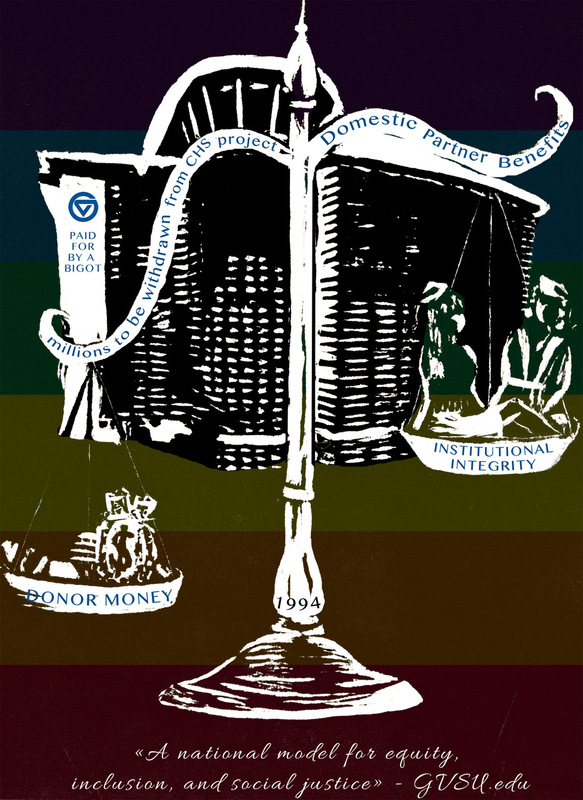 A new print by GVSU student Ciara Pink, beautifully depicts not on the historical struggle to win domestic partner benefits at GVSU, but the hypocrisy of the university, which claims to embrace, equity, inclusion and social justice. Grand Valley State University used to be Grand Valley States Colleges, consisting of William James, Thomas Jefferson, Seidman School and College IV. William James College (WJC) was very progressive and experimental in its approach to education. WJC attracted faculty from all over the country, including many feminists who developed radical programs like Women, World and Wonder. Some of these women who taught at William James or Thomas Jefferson Colleges (both of which were closed by 1983) were also part of the radical feminist group in Grand Rapids, known as Aradia. Many of the members of Aradia were also lesbian and were part of an effort in the 1990s to get GVSU to adopt domestic partner benefits. Based on interviews we conducted for the film, A People’s History of the LGBTQ Community in Grand Rapids, GVSU was set to adopt domestic partner benefits in 1995. However, word of the proposed policy was leaked to a GR Press reporter who wrote a story, which resulted in pressure from major financial donors (Richard DeVos and Peter Cook) threatening to with hold money if the university adopted such a policy. A second attempt was made in 2003, to get domestic partner benefits passed at GVSU, but then President Mark Murray blocked the attempt. Murray stated at the time, “As a University that has benefited from very generous support from the private philanthropic community, we must recognize the prevailing views of those who provide such support.” This statement by Murray underscores the power that donors have had on policy at GVSU. Domestic partner benefits was not adopted until 2008, some 13 years after it was promised. This entry was posted in LGBTQ Movement, People's History Artwork. Bookmark the permalink.